While the first family relaxed on Martha’s Vineyard, the Oval Office underwent a makeover. President Barack Obama returned to Washington to see his workspace transformed with fresh paint and wallpaper, new or reupholstered furniture, and a custom-made rug, designed with his input, according to a press pool report. The interior decorating was paid for by the non-profit White House Historical Association through a contribution from the Presidential Inaugural Committee, White House officials said. The fund is being used to pay the redecorating costs of numerous other rooms at the White House, including the Yellow Oval Room, Center Hall and West Sitting Hall. Oval Office walls were covered with handmade striped wallpaper produced in Amagansett, N.Y. The trim around the Office was re-painted with American-made Benjamin Moore paint custom-mixed by Donald Kaufman Color. The new wheat, cream and blue colored oval-shaped rug is made of 25 percent recycled wool. The rug has the Presidential seal in the center and historical quotes of meaning to President Obama around the border. The rug was made and donated by the Scott Group, an American carpet manufacturer headquartered in Grand Rapids, Mich. The Scott Group previously made the Oval Office rug designed for former President Bill Clinton, as well as rugs for the White House State Dining Room. “The Arc of the Moral Universe is Long, But it Bends Towards Justice” – Martin Luther King, Jr.
Armchairs: The two mahogany armchairs in front of the fireplace, previously used by President George W. Bush, were reupholstered with a caramel-colored leather. Desk Chair: The President’s brown leather desk chair was produced in New York. Coffee Table: The coffee table is made out of American walnut and mica by a New York company. 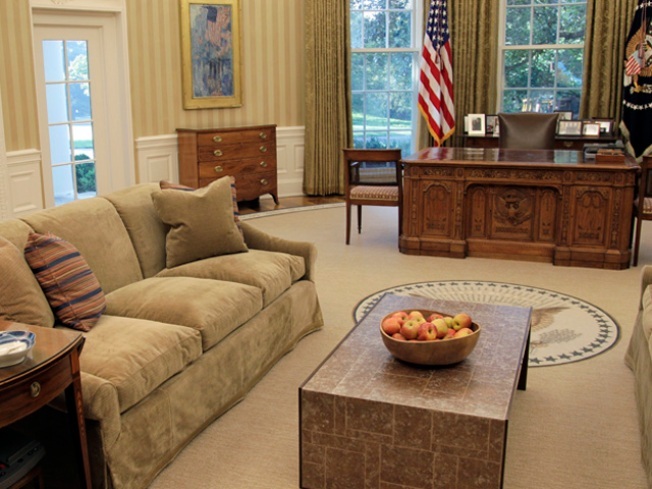 Couches: The couches in the Oval Office were custom-made in New York. The fabric, a custom-made light brown cotton with red, white and blue threads running through it, was woven in Pennsylvania. Lamps: The two new table lamps have blue ceramic bases and were produced in New York. President Bill Clinton and President George W. Bush had comparable redesigns of the Oval Office when they were in office, according to a White House statement. The cost of this Oval Office makeover was in line with what those redesigns cost, the White House press office told a pool reporter. So what happens to the old furniture that is no longer in use? Don’t expect any South Lawn yard sales. The furniture remains the property of the White House and will be placed in a storage facility, officials said.